Peatland as a potential habitat for colonisation by invasive species is restricted due to its characteristics. The high moisture content of the peat soil promotes a very acidic substrate, of low nutritional value which acts as a natural control for many invasive species. However if this habitat is altered, particularly by human activity such as drainage, it becomes a highly suitable environment for rapid colonisation by certain invasive species. To date, the main species that have caused problems for peatland conservation include Rhododendron (Rhododendron ponticum), Pitcher plant (Sarracenia purpurea) and a number of conifer species. 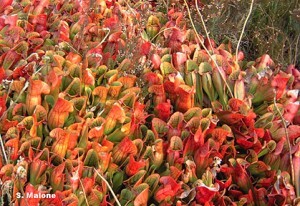 Both Rhododendron and Pitcher plant can exclude the native bogland flora by competing for space. Once established both species can spread quickly. Conifer trees that become established on a bog surface have the additional effects of causing drying out and increased shading which transforms the bog surface into an unsuitable habitat for peatland flora, and ultimately creates conditions suitable for woodland. Boggy ground which has been reclaimed for agricultural purposes and subsequently abandoned provides an ideal habitat for Gunnera tinctoria. This species has become a particular problem on Achill Island, Co. Mayo. The table below shows the number of peatland sites of conservation importance that are known to be impacted by invasive plant species. IPCC’s sites database indicates that 84 conservation worthy peatland sites are affected by alien species. The overall trend is likely to be an increase in invasive species on peatlands, in part as a result of the on-going drying out process caused by drainage associated with turf cutting and the spreading of pines from adjacent plantations. A survey by Fernandez et al, (2005) found invasive species on 35 out of 48 raised bogs surveyed in the Irish midlands. The most common invasive species surveyed were Pinus contorta, Rhododendron ponticum and Sarracenia purpurea (shown in the photograph inset). The table shows the number of conservation worthy peatlands in the Republic of Ireland threatened by invasive species. Source: IPCC’S Peatland Sites Database 2009.